Early hints of just such an outcome are evident in the January update of the International Monetary Fund's World Economic Outlook. While the IMF has marked down its 2019-20 forecast of world GDP by only 0.2 percent (from 3.7 percent to 3.5 percent), it has made just a fractional reduction to its 4 percent prognosis for global trade growth. This is certainly puzzling. In a climate of increased tariffs between the US and China as well as Brexit-related risks to pan-regional trade in the euro area, there is good reason to believe that further reductions in the global trade outlook are likely. The world economy is already on shaky ground when it comes to support from global trade. The trade intensity of global growth has been decidedly weaker in the current economic expansion than in previous cycles. Following a crisis-induced plunge of 10.4 percent in the volume of global trade in 2009 recovery has been rather muted. After a brief two-year rebound in 2010-11, world trade growth has averaged just 3.6 percent over the 2012-18 period - about half the 7.1 percent average annual pace in the 20 years before the global financial crisis. To be sure, this downshift in global trade may be traceable to a relatively weak post-crisis recovery in the world economy. But an examination of the ratio of growth in global trade relative to growth in world output - a construct that normalizes for different recovery trajectories - says otherwise. In the two prior expansions - 1985-90 and 2002-07 - this ratio averaged 1.6. That means that once the cyclical noise of post-recession rebounds subsided, growth of global trade was about 60 percent faster than growth in world GDP. By contrast, in the current expansion, that ratio has averaged just 1.0 over the comparable 2012-18 period, meaning that global trade has slowed to a pace only equal to the growth of world output. Debate rages as to why growth in the global trade cycle has slowed so sharply in recent years. Extensive research published by the IMF in late 2016 attributed the bulk of this development to subdued business capital spending, while finding only small contributions from protectionism. Yet the world has changed a lot in the two years since these results were released. While the capital spending shortfall still persists - despite a temporary increase from large corporate tax cuts in countries like the US - there has been a marked increase in protectionist actions, with attendant pressures on global supply chains. As a result, a rethinking of the IMF findings is probably in order. Against this backdrop, a rapidly unfolding China slowdown is all the more problematic. While recent GDP data point to only a slight downshift in late 2018 - 6.4 percent year-over-year growth in the fourth quarter versus a 6.5 percent comparison in the third period - the high frequency monthly data underscored sharp declines in December retail sales of key discretionary consumption items such as automobiles and mobile phones. At the same time, China's exports fell 4.4 percent in December as tariff-related weakness to US markets finally appears to be taking a meaningful toll. Needless to say, depending on the outcome of US-China trade negotiations, there could well be more to come on the downside for Chinese exports to the US. Moreover, while China is moving aggressively to counter the cyclical shortfall in domestic activity, it could be several months before its recent policy actions start to take hold. In the meantime, risks remain very much on the downside for Chinese import demand. China is the world's largest exporter and second largest importer. Its negative impact on an already weakened global trade cycle is only just starting to become apparent. 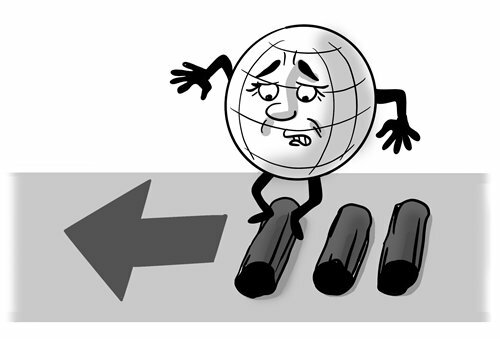 The broad consensus of Western observers believes that the Chinese economy is likely to weaken further. GDP growth is feared to fall well short of the 6.6 percent pace of 2018, which, in and of itself, already represents a sharp slowdown from the 10 percent average gains from 1980 to 2012. While these concerns can hardly be dismissed out of hand, they have a striking sense of déjà vu. Time and again - but especially in the depths of the Asian financial crisis of the late 1990s and again in the midst of the global financial crisis a decade later - there was a crescendo of despair claiming that China would be next to fall. And yet, time and again, China has defied this pessimistic prognosis. Will that be the case again? Surely, there is good reason to take current concerns seriously. Could it already be too late for China to avoid a Japanese-style debt crisis? As cyclical pressures on the real economy intensify, Chinese policymakers may well be tempted to revert to yet another round of debt-fueled growth as they did in the depth of the global recession of 2008-09. This would be a serious mistake. China's overall debt-to-GDP ratio is more than 100 percentage points higher today than it was back then - having moved up from 138 percent in late 2008 to 253 percent in mid-2018, according to BIS statistics. The leeway to act is therefore far more limited as a result. The optimistic case for China, which I continue to embrace, invariably requires a leap of faith when circumstances seem especially challenging. Like comparable circumstances in the past, reforms are the only way out. That is not only true of ongoing efforts at deleveraging required to avoid a Japanese-like endgame but also for more meaningful excess-capacity shedding, market-oriented SOE reforms. It is also true of China's need to push ahead on market opening reforms by eliminating foreign ownership caps in order to improve China's competitive climate and ameliorate the mounting conflict with the US. China without reforms points to an opportunity squandered rather than to a challenge that begets a new opportunity. Needless to say, China's economic outlook has important implications for the global economy. With China having accounted for more than 30 percent of global GDP growth since 2010, it is safe to say that as China sneezes, the rest of the world is likely to catch a cold. Meanwhile, a fragile global trade cycle is facing major stress in 2019. The risks of a major shortfall in world GDP growth cannot be minimized.